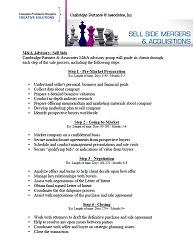 The Cambridge Partners M&A team specializes in providing merger and acquisition advice for lower middle market companies. We are specialists at helping owners and executives sell or acquire companies, divisions, business units, or product lines with revenues between $5 million to $150 million. We advise clients in the sale of a closely held business or a business segment. These services are provided to business owners, corporations, fiduciaries, trustees and investment groups (private equity). Cambridge Partners has extensive expertise in mergers, acquisitions, and divestitures for clients. We provide senior-level investment banking service and attention on all transactions, middle market and smaller. Members of our M&A team have relationships with hundreds of client companies and financial buyers. We have the ability to identify the most likely and best suited parties to a transaction. Follow this link to learn more about "what we do". We represent qualified buyers with acquisition related searches and market research. We can also help our clients source various types of debt and equity capital. We have significant experience in providing valuations, fairness opinions and other valuation related services for purposes of due diligence, financial planning, litigation support, tax and estate, FASB compliance, bank financing and many others.